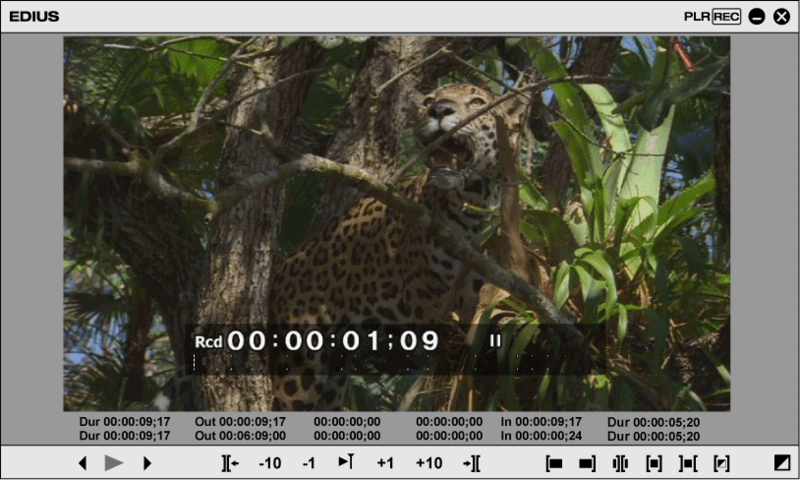 You can switch to the trim mode to perform editing to fine-adjust video in 1 frame units or 10 frame units by button operation. Trimming is also possible in the standard mode by dragging the mouse. The current trimming type is displayed on the status bar of the timeline window. The trim mode can be switched to the standard mode by the following operation. Click [Mode] on the menu bar, and click [Normal Mode]. Click [Switch to Normal Mode] on the lower right of the trim mode screen. Press [F6] on the keyboard again. Buttons exclusively for trimming and the preview are displayed in this window. When the trim mode button is clicked, the cut point corresponding to the trim mode is automatically selected. Trimming can also be performed more accurately by entering numerical values to the timecode for trimming. Switch the display to 1/2/4 screens depending on the trimming operation. 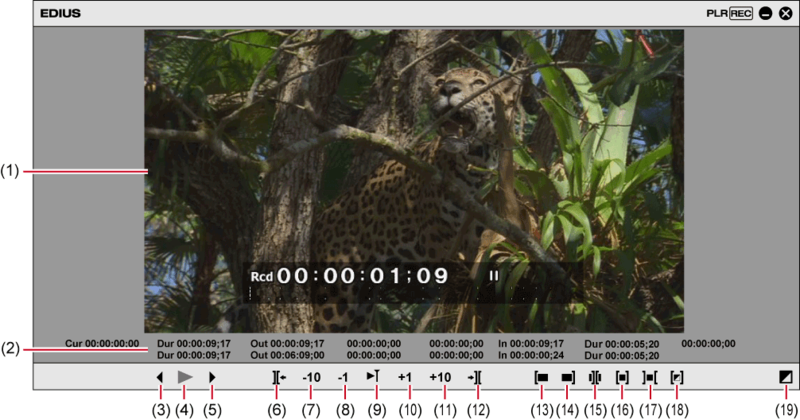 Display the timecode of the In or Out point of the clip to edit. You can also change the trimming position by directly entering a numerical value. Move to the previous frame. Play the timeline in the forward direction. When this button is clicked during playback, playback pauses. Move to the next frame. Move the focus of the cut point and timeline cursor to the edit point (cut point) on the left of the current cut point position. Adjust the trimming position in - 10-frame units. Adjust the trimming position in - 1-frame units. Repeatedly play back the area around the focused cut point. Click it again to stop. Adjust the trimming position in + 1-frame units. Adjust the trimming position in + 10-frame units. Move the focus of the cut point and timeline cursor to the edit point (cut point) on the right of the current cut point position. Switch to the trim mode (In point). Only the In point can be selected. Switch to the trim mode (Out point). Only the Out point can be selected. Switch to the trim mode (slide). Only the cut point of the slide trim can be selected. Switch to the trim mode (slip). Only the cut point of the slip trim can be selected. Switch to the trim mode (rolling). Only the cut point of the rolling trim can be selected. Switch to the trim mode (transition). Only the transition (clip transition, track transition)/audio cross fades can be selected. Switch the trim mode to the standard mode. * Sometimes there are no cut points that can be moved to on the selected tracks, or the cut point is sometimes disabled depending on the operation button.